As I've already done 2 of the Robot Continuity's Series, and only the first of the Cyber's, I made up my StarForce Set. As always, I appreciate any helpful comments, especially because of the sizable amount of time spent on this. A number of the card art was stitched together by me, such as the Taurus and Cygnus group, though I did use some pics from DeviantArt. I apologize for not having all your names, DA artists, but if you wish you can contact me and ask for your DA name to be placed with the respective card. When this card is Normal Summoned, you can add 1 "Visualizer" to your hand from your Deck. When you draw a "Battle Card" Spell Card, you can reveal it to your opponent to return 1 card on the field to its owner's hand. 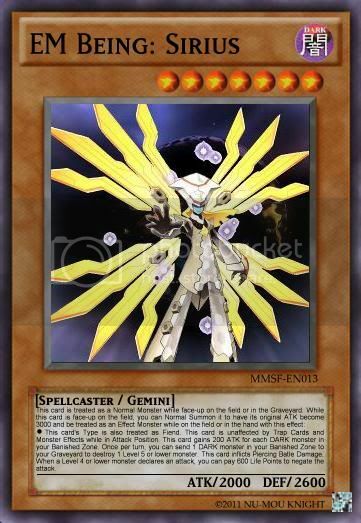 When this card is attacked by a Level 4 or higher monster, you can discard 1 card to negate the attack and Special Summon 1 "EM Being: Omega-Xis" from your hand or Deck. It cannot attack during your next Battle Phase. 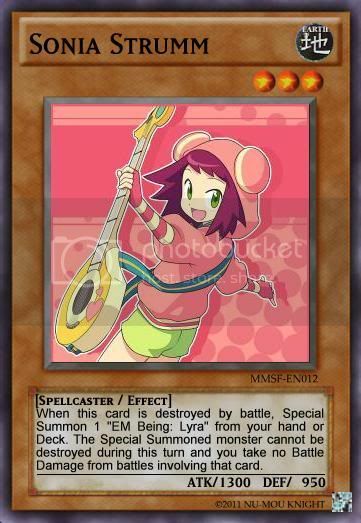 When this card is destroyed by battle, Special Summon 1 "EM Being: Lyra" from your hand or Deck. The Special Summoned monster cannot be destroyed during this turn and you take no Battle Damage from battles involving that card. Once per turn, you can shuffle 1 card in your hand into your Deck and this cad gains 200 ATK and DEF until the End Phase. You take no Battle Damage from battles involving this card. When this card inflicts Battle Damage to your opponent's Life Points, make the Battle Damage your opponent takes 0 and shuffle 1 card from your opponent's hand back into their Deck. You can place this card on top of your Deck to add 1 "EM Being: Taurus" from your Deck to your hand. 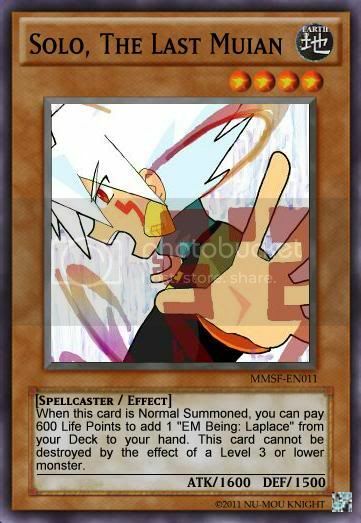 When this card is Normal Summoned, you can pay 600 Life Points to add 1 "EM Being: Laplace" from your Deck to your hand. 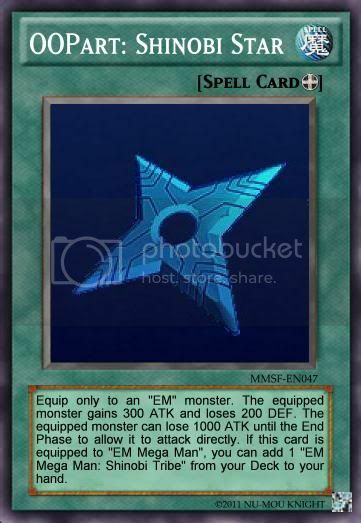 This card cannot be destroyed by the effect of a Level 3 or lower monster. 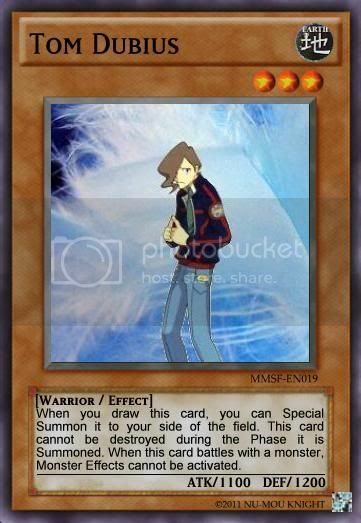 When you draw this card, you can Special Summon it to your side of the field. This card cannot be destroyed during the Phase it is Summoned. When this card battles with a monster, Monster Effects cannot be activated. When this card is Special Summoned, you can select 1 "Geo Stelar" you control. The selected monster gains 1 Level. This card's Type can be treated as Warrior during your Main and Battle Phase. When a "Geo Stelar" you control is targeted by a card effect or attack, you can return this card from the field to your hand to negate the attack or effect. 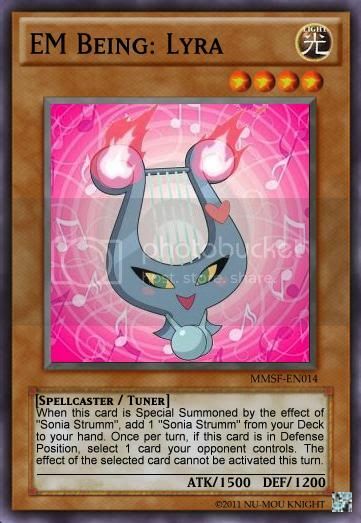 When this card is Special Summoned by the effect of "Sonia Strumm", add 1 "Sonia Strumm" from your Deck to your hand. 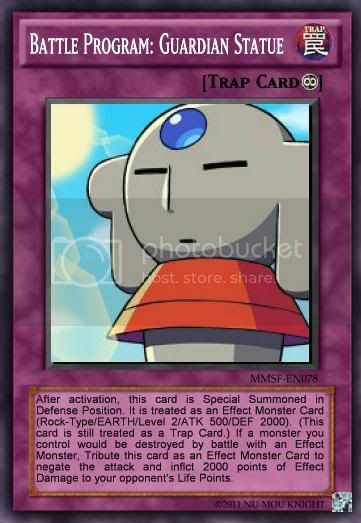 Once per turn, if this card is in Defense Position, select 1 card your opponent controls. The effect of the selected card cannot be activated this turn. When this card is Normal Summoned, your opponent loses 200 Life Points and draw 1 card. If the drawn card can be Normal Summoned, Special Summon it in Defense Position. It cannot attack or activate its effect during this turn. When this card destroys a monster by battle, inflict 400 points of Effect Damage to your opponent's Life Points. You can Special Summon this card from your hand if you control "Solo, The Last Muian". Control of monsters you control cannot switch. If this card is sent to the Graveyard as a Synchro Material Monster to Synchro Summon "Rogue, The Mu Avenger", you can Banish this card from your Graveyard to add 1 "Rogue's Broadsword" from your Deck to your hand. You can Special Summoned this card from your hand while you control "Tom Dubius". "Tom Dubius" cannot be targeted by card effects while this card is in Defense Position. Once per turn, you can pay 300 Life Points to Special Summon 1 "Swan Token" (Winged Beast-Type/WIND/Level 2/ATK 1000/ DEF 500) in Defense Position. 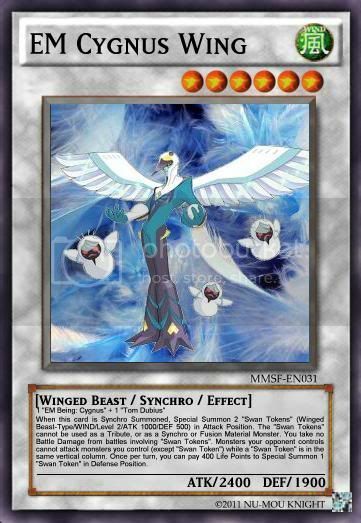 The "Swan Tokens" cannot be used as a Tribute for a Tribute Summon, or as a Synchro or Fusion Material Monster. 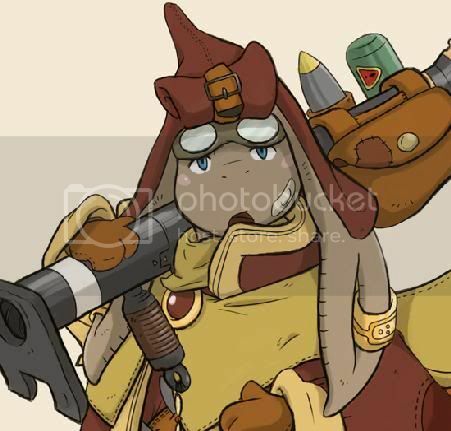 You take no Battle Damage from battles involving "Swan Tokens". *This card's Type is also treated as Fiend. This card is unaffected by Trap Cards and Monster Effects while in Attack Position. This card gains 200 ATK for each DARK monster in your Banished Zone. Once per turn, you can send 1 DARK monster in your Banished Zone to your Graveyard to destroy 1 Level 5 or lower monster. This card inflicts Piercing Batle Damage. When a Level 4 or lower monster declares an attack, you can pay 600 Life Points to negate the attack. This card cannot be Normal Summoned or Set. 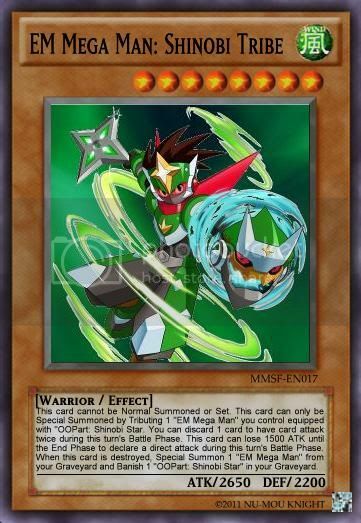 This card can only be Special Summoned from the hand or Graveyard by paying half your Life Points while "OOPart: Shinobi Star", "OOPart: Saurian Fossil", and "OOPart: Zerker Sword" are in your Banished Zone. 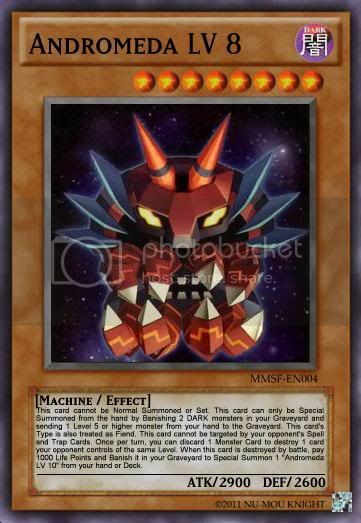 This card's Type is also treated as Fiend, When this card is Special Summoned, destroy 4 cards on the field. This card gains 100 ATK and 200 DEF for each DARK monster in your Graveyard and/or Banished Zone. Once per turn, you can discard your hand to the Graveyard to destroy the same number of cards your opponent controls and inflict 500 points of Effect Damage to your opponent's Life Points for each card destroyed by this effect. 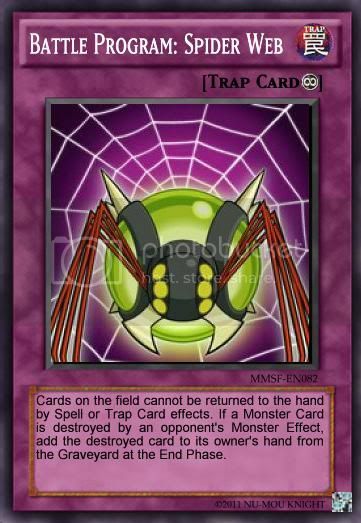 This card cannot be removed from the field by card effects. This card inflicts Piercing Battle Damage. This card cannot be Normal Summoned or Set. This card can only be Special Summoned from the hand by Banishing 2 DARK monsters in your Graveyard and sending 1 Level 5 or higher monster from your hand to the Graveyard. This card's Type is also treated as Fiend. This card cannot be targeted by your opponent's Spell and Trap Cards. Once per turn, you can discard 1 Monster Card to destroy 1 card your opponent controls of the same Level. When this card is destroyed by battle, pay 1000 Life Points and Banish it in your Graveyard to Special Summon 1 "Andromeda LV 10" from your hand or Deck. This card cannot be Normal Summoned or Set. 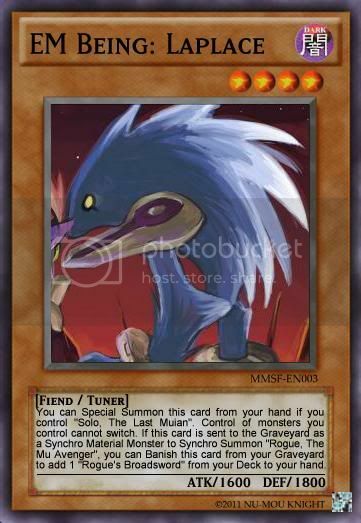 This card can only be Special Summoned from the hand or Deck by paying 2000 Life Points and Banishing 2 DARK monsters in your Graveyard or by the effect of "Andromeda LV 8". This card's Type is also treated as Fiend. 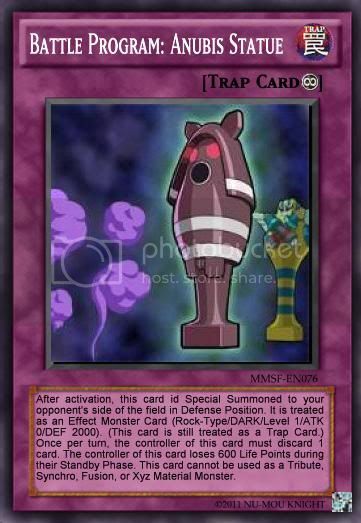 This card cannot be removed from the field by card effects. This card gains 100 ATK and DEF for each Level 4 or higher DARK monster in your Banished Zone. Once per turn, send 1 monster you control or in your hand to the Graveyard. If you cannot, return this card to your hand and lose 800 Life Points. This card cannot be Normal Summoned or Set. This card cannot be Special Summoned except by Banishing 1 WIND or WATER monster in your Graveyard. This card returns to its owner's hand during the End Phase of the turn it is Special Summoned. This card's Type is also treated as Aqua. Once per turn, you can pay Life Points in multiples of 200 to select the same number of cards your opponent controls. The selected cards cannot declare an attack, change their Battle Position, or activate effects until your next End Phase. 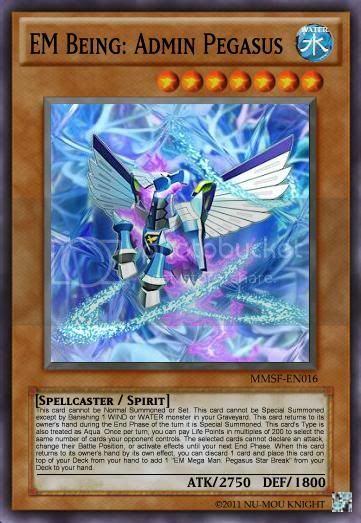 When this card returns to its owner's hand by its own effect, you can discard 1 card and place this card on top of your Deck from your hand to add 1 "EM Mega Man: Pegasus Star Break" from your Deck to your hand. This card cannot be Normal Summoned or Set. This card cannot be Special Summoned except by Banishing 1 WIND or LIGHT monster in your Graveyard. This card returns to its owner's hand during the End Phase of the turn it is Special Summoned. Once per turn, you can pay Life Points in multiples of 300 to return the same number of Spell, Trap, or Level 6 or lower Monster Cards your opponent controls to their owner's hand. The returned monsters cannot be Summoned during your opponent's next turn. When this card returns to its owner's hand by its own effect, you can discard 1 card and place this card on top of your Deck from your hand to add 1 "EM Mega Man: Dragon Star Break" from your Deck to your hand. This card cannot be Normal Summoned or Set. 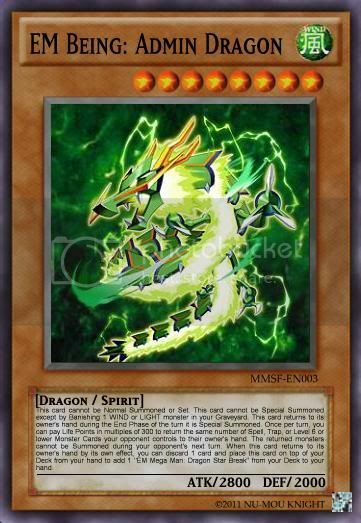 This card cannot be Special Summoned except by Banishing 1 FIRE or EARTH monster1 in your Graveyard. This card returns to its owner's hand during the End Phase of the turn it is Special Summoned. This card's Type is also treated as Pyro. Once per turn, you can pay Life Points in multiples of 400 to destroy the same number of Spell, Trap, or Level 4 or lower Monster Cards your opponent controls. This card inflicts Piercing Battle Damage. When this card returns to its owner's hand by its own effect, you can discard 1 card and place this card on top of your Deck from your hand to add 1 "EM Mega Man: Leo Star Break" from your Deck to your hand. 1 "EM Being: Omega-Xis" + 1 "Geo Stelar"
During the turn where this card is Synchro Summoned, it gains 200 ATK. When this card destroys a Level 6 or higher monster by battle, draw 1 card. Equip Spell Cards equipped to this monster cannot be destroyed by card effects. If this card does not declare an attack during your Battle Phase, it can attack your opponent directly during your next Battle Phase. 1 "EM Being: Lyra" + 1 "Sonia Strumm"
When this card is Synchro Summoned, Special Summon 2 "Amp Tokens" (Machine-Type/WIND/Level 1/ATK 500/DEF 0) in Defense Position. During your Main Phase 1, you can pay 600 Life Points to select cards your opponent controls in the same vertical columns as "Amp Tokens" you control. The selected cards cannot activate their effects or be flipped face-up until your opponent's next End Phase. 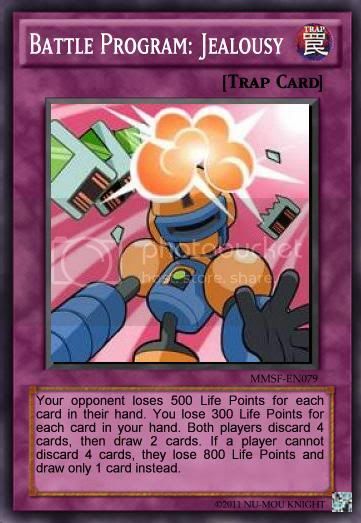 When this card inflicts Battle Damage to your opponent's Life Points, randomly discard 1 card from your opponent's hand. This card cannot be destroyed by a Spell or Counter Trap Card. 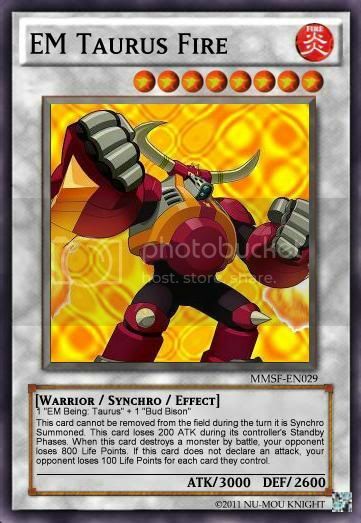 1 "EM Being: Taurus" + 1 "Bud Bison"
This card cannot be removed from the field during the turn it is Synchro Summoned. This card loses 200 ATK during its controller's Standby Phases. When this card destroys a monster by battle, your opponent loses 800 Life Points. 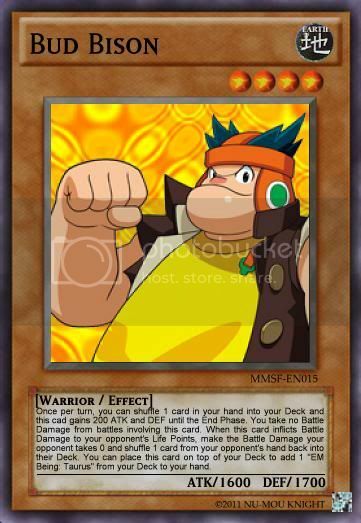 If this card does not declare an attack, your opponent loses 100 Life Points for each card they control. 1 DARK Tuner + 1 "Solo, The Last Muian"
When this card is Synchro Summoned, destroy 1 face-down card your opponent controls. If your opponent does not control a face-down card when this effect is activated, flip 2 cards your opponent controls face-down instead. When this card destroys a monster by battle, place 1 Indie Counter on this card. (max. 3) You can remove Indie Counters from this card to activate the corresponding effect: *1: Destroy 1 face-down card on the field. *2: Draw 1 card. *3: Destroy 1 face-up Level 5 or lower monster and return a card adjacent to the destroyed monster to its owner's hand. This card cannot be Normal Summoned or Set. This card can only be Special Summoned from your hand by Banishing 1 Level 5 or higher FIRE monster in your Graveyard. This card's Type is also treated as Pyro. Once per turn, this card cannot be destroyed by battle or an opponent's Spell Card. 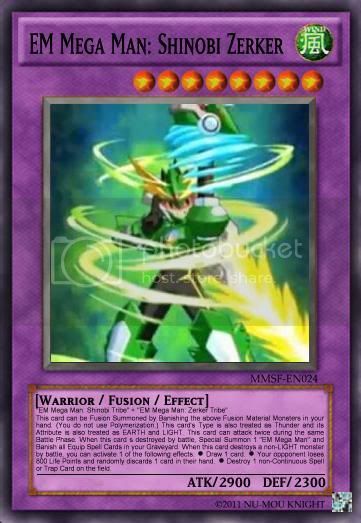 When this card destroys an EARTH monster by battle, you can destroy 1 Spell or Trap Card on the field OR draw 1 card. While you have 4 or more FIRE monsters in your Graveyard and/or Banished Zone, you can inflict 800 points of Effect Damage to your opponent's Life Points during your Standby Phase. This card cannot be Normal Summoned or Set. 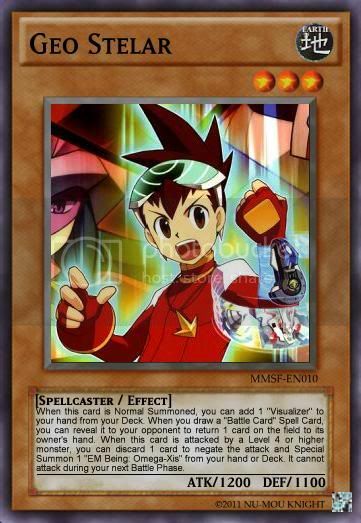 This card cannot be Special Summoned except by Tributing 1 "EM Mega Man" you control and revealing 1 "EM Being: Admin Pegasus" in your hand. When this card destroys a monster by battle, select 1 card in your opponent's hand. The selected card cannot be played during your opponent's next turn. Once per turn, you can skip your Battle Phase and pay 900 Life Points to select all cards your opponent controls. The selected cards cannot be flipped face-up, declare an attack, activate their effects, or change their Battle Position until your next Main Phase 2. When this card battles with a Thunder-Type monster, Banish it and Special Summon 1 "EM Mega Man" from your Graveyard or Banished Zone. This card cannot be Normal Summoned or Set. This card cannot be Special Summoned except by Tributing 1 "EM Mega Man" you control and revealing 1 "EM Being: Admin Dragon" in your hand. Once per turn, you can return all face-down Spell and Trap Cards on the field to their respective owner's hands. If you activate this effect, this card loses 900 ATK until your next Standby Phase. 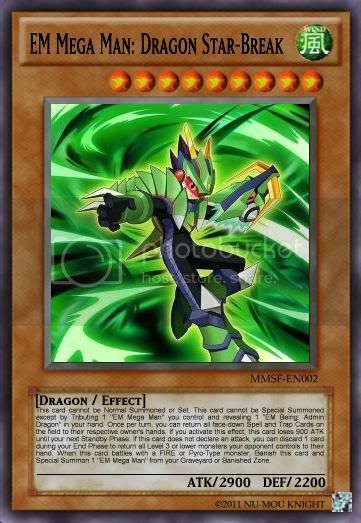 If this card does not declare an attack, you can discard 1 card during your End Phase to return all Level 3 or lower monsters your opponent controls to their hand. 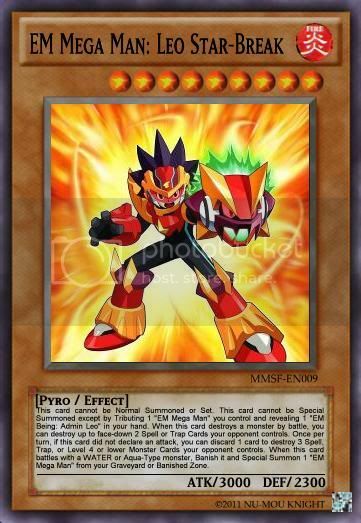 When this card battles with a FIRE or Pyro-Type monster, Banish this card and Special Summon 1 "EM Mega Man" from your Graveyard or Banished Zone. This card cannot be Normal Summoned or Set. This card cannot be Special Summoned except by Tributing 1 "EM Mega Man" you control and revealing 1 "EM Being: Admin Leo" in your hand. When this card destroys a monster by battle, you can destroy up to face-down 2 Spell or Trap Cards your opponent controls. Once per turn, if this card did not declare an attack, you can discard 1 card to destroy 3 Spell, Trap, or Level 4 or lower Monster Cards your opponent controls. When this card battles with a WATER or Aqua-Type monster, Banish it and Special Summon 1 "EM Mega Man" from your Graveyard or Banished Zone. This card cannot be Normal Summoned or Set. 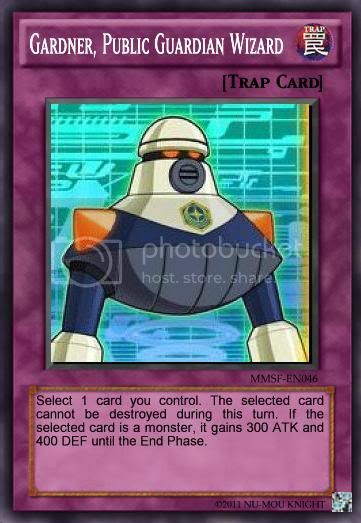 This card can only be Special Summoned by Tributing 1 "EM Mega Man" you control equipped with "OOPart: Saurian Fossil". 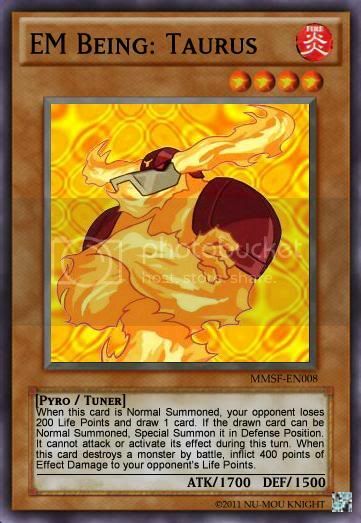 This card's Type is also treated as Pyro. One per turn, you can Tribute 1 monser you control to destroy all EARTH monsers your opponent controls whose Level is equal to or less than that of the Tributed monster. 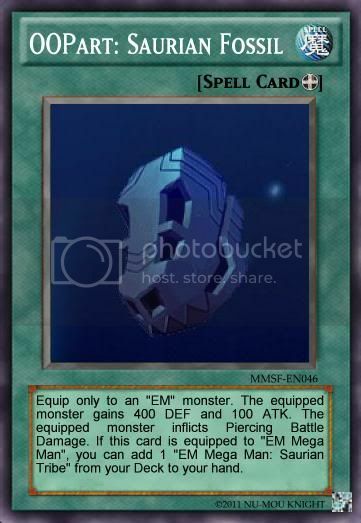 When this card destroys an EARTH monster by battle, the destroyed monster is Banished in the Graveyard. When this card is destroyed, Special Summon 1 "EM Mega Man" from your Graveyard and Banish 1 "OOPart: Saurian Fossil" in your Graveyard. This card cannot be Normal Summoned or Set. 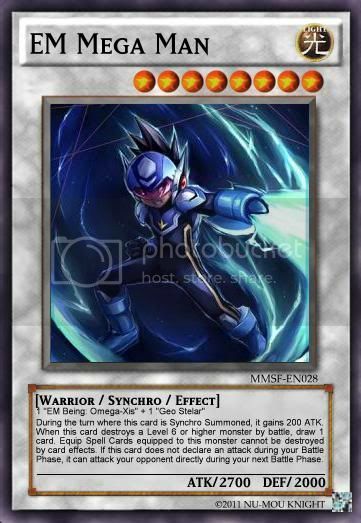 This card can only be Special Summoned by Tributing 1 "EM Mega Man" you control equipped with "OOPart: Shinobi Star. You can discard 1 card to have card attack twice during this turn's Battle Phase. This card can lose 1500 ATK until the End Phase to declare a direct attack during this turn's Battle Phase. When this card is destroyed, Special Summon 1 "EM Mega Man" from your Graveyard and Banish 1 "OOPart: Shinobi Star" in your Graveyard. This card cannot be Normal Summoned or Set. This card can only be Special Summoned from your hand by Tributing 1 "EM Mega Man" you control equipped with "OOPart: Zerker Sword". 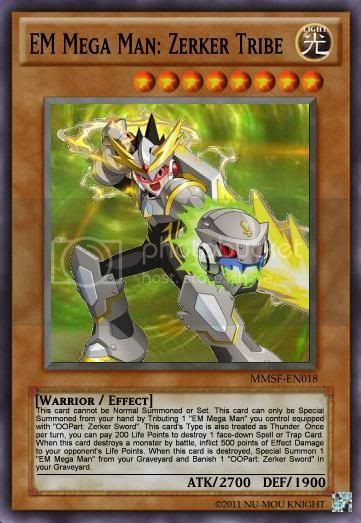 This card's Type is also treated as Thunder. Once per turn, you can pay 200 Life Points to destroy 1 face-down Spell or Trap Card. When this card destroys a monster by battle, inflict 500 points of Effect Damage to your opponent's Life Points. When this card is destroyed, Special Summon 1 "EM Mega Man" from your Graveyard and Banish 1 "OOPart: Zerker Sword" in your Graveyard. 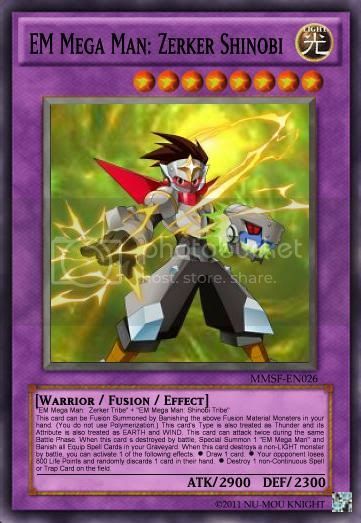 "EM Mega Man: Shinobi Tribe" + "EM Mega Man: Saurian Tribe"
This card can be Fusion Summoned by Banishing the above Fusion Material Monsters in your hand. (You do not use Polymerization.) 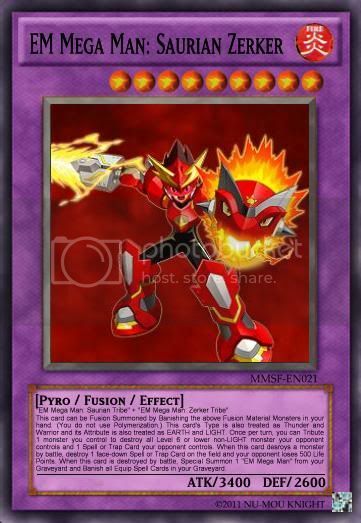 This card's Type is also treated as Pyro and its Attribute is also treated as EARTH and FIRE. When this card destroys a Level 5 or higher non-FIRE monster your opponent controls, this card can attack again. This card can lose 1500 ATK until the End Phase to attack directly during this turn. When this card is destroyed by battle, Special Summon 1 "EM Mega Man" from your Graveyard and Banish all Equip Spell Cards in your Graveyard. 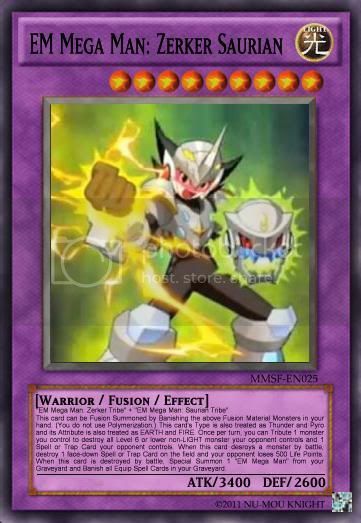 "EM Mega Man: Saurian Tribe" + "EM Mega Man: Zerker Tribe"
This card can be Fusion Summoned by Banishing the above Fusion Material Monsters in your hand. (You do not use Polymerization.) This card's Type is also treated as Thunder and Warrior and its Attribute is also treated as EARTH and LIGHT. Once per turn, you can Tribute 1 monster you control to destroy all Level 6 or lower non-LIGHT monster your opponent controls and 1 Spell or Trap Card your opponent controls. When this card desroys a monster by battle, destroy 1 face-down Spell or Trap Card on the field and your opponent loses 500 Life Points. When this card is destroyed by battle, Special Summon 1 "EM Mega Man" from your Graveyard and Banish all Equip Spell Cards in your Graveyard. 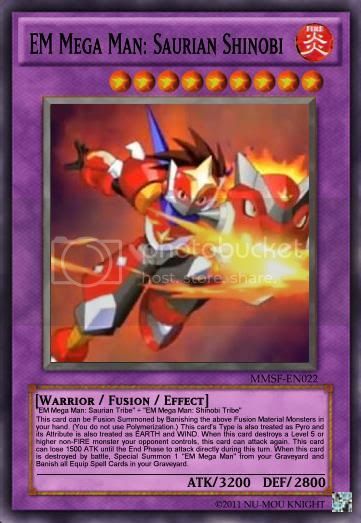 "EM Mega Man: Zerker Tribe" + "EM Mega Man: Shinobi Tribe"
This card can be Fusion Summoned by Banishing the above Fusion Material Monsters in your hand. 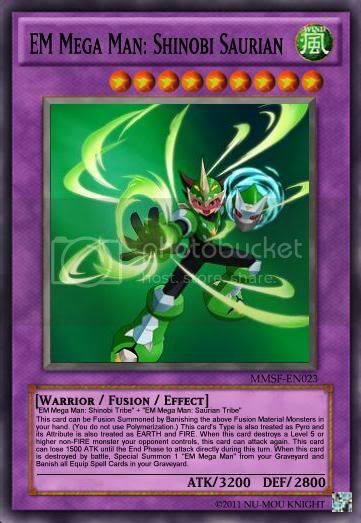 (You do not use Polymerization.) This card's Type is also treated as Thunder and its Attribute is also treated as EARTH and WIND. This card can attack twice during the same Battle Phase. 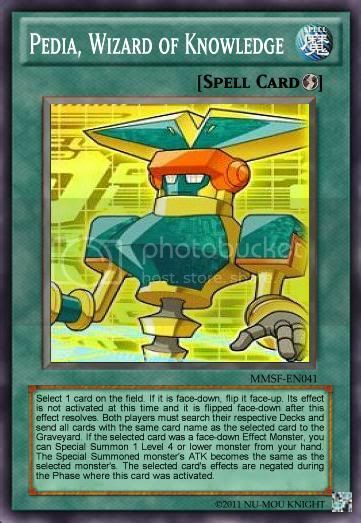 When this card s destroyed by battle, Special Summon 1 "EM Mega Man" and Banish all Equip Spell Cards in your Graveyard. 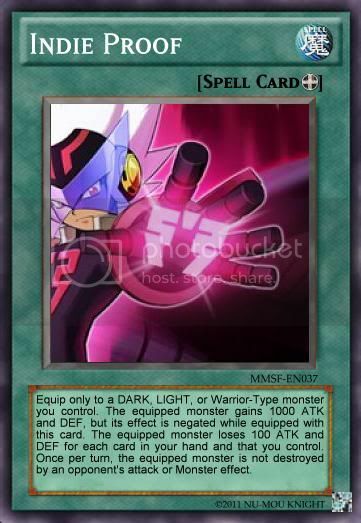 When this card destroys a non-LIGHT monster by battle, you can activate 1 of the following effects: *Draw 1 card. *Your oppponent loses 800 Life Points and randomly discards 1 card in their hand. *Destroy 1 non-Continuous Spell or Trap Card on the field. 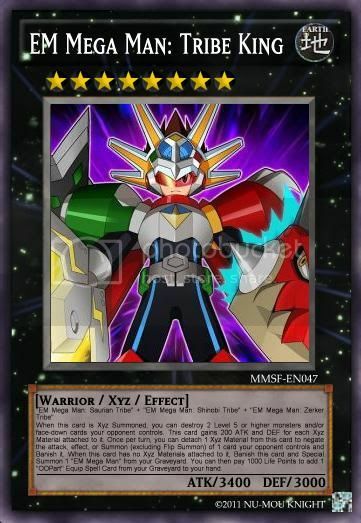 "EM Mega Man: Saurian Tribe" + "EM Mega Man: Shinobi Tribe" + "EM Mega Man: Zerker Tribe"
When this card is Xyz Summoned, you can destroy 2 Level 5 or higher monsters and/or face-down cards your opponent controls. This card gains 200 ATK and DEF for each Xyz Material attached to it. Once per turn, you can detach 1 Xyz Material from this card to negate the attack, effect, or Summon (excluding Flip Summon) of 1 card your opponent controls and Banish it. 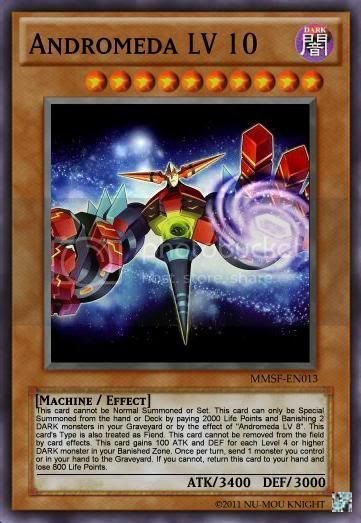 When this card has no Xyz Materials attached to it, Banish this card and Special Summon 1 "EM Mega Man" from your Graveyard. You can then pay 1000 Life Points to add 1 "OOPart" Equip Spell Card from your Graveyard to your hand. 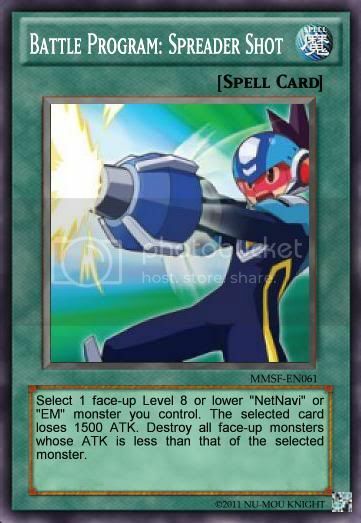 "EM Mega Man" + "Rogue, Avenger of Mu"
When this card is Xyz Summoned, destroy up to 2 face-down cards your opponent controls. If your opponent does not control any face-down cards when this effect is activated, return up to 2 cards on the field to their respective owner's hand. This card can be treated as "Rogue, The Mu Avenger" during your Main Phase. This card loses 200 ATK and DEF for each monster you control. Once per turn, this card is not destroyed by a card effect. 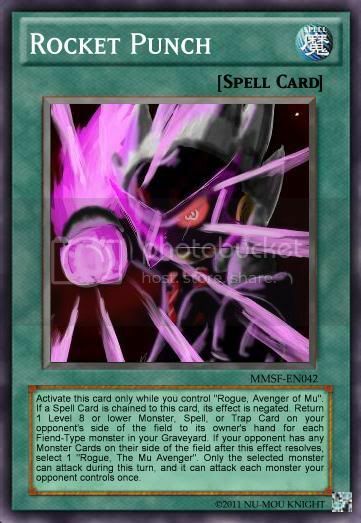 You can detach 1 Xyz Material from this card and this card cannot be removed from the field during this turn. 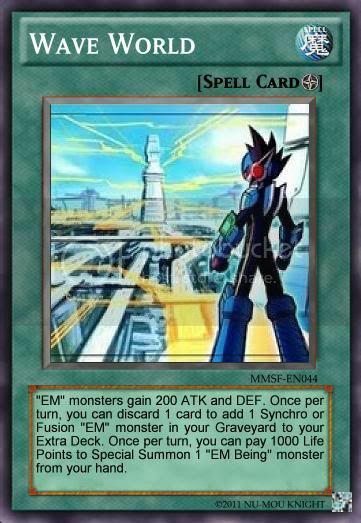 While "EM Mega Man" is attached to this card as an Xyz Material, when this card is removed from the field, you can Special Summon "EM Mega Man" from your Graveyard. This card's effect cannot be negated. Pay 2000 Life Points and Tribute 1 "EM Mega Man" and send 1 "OOPart: Saurian Fossil", 1 "OOPart: Shinobi Star", and 1 "OOPart: Zerker Sword" from your hand or your side of the field to the Graveyard. 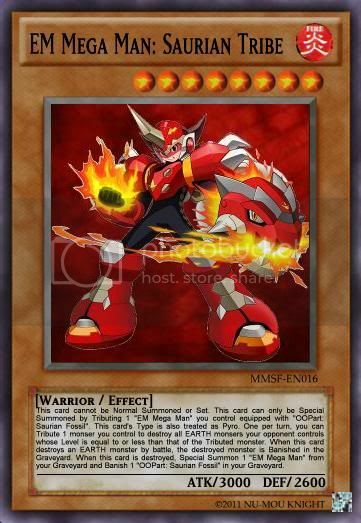 Special Summon 1 "EM Mega Man: Saurian Tribe", 1 "EM Mega Man: Shinobi Tribe", and 1 "EM Mega Man: Zerker Tribe" from your hand or Deck, regardless of their card effects. The Special Summoned monsters cannot be removed from the field by an opponent's card effect and cannot declare an attack during this turn. 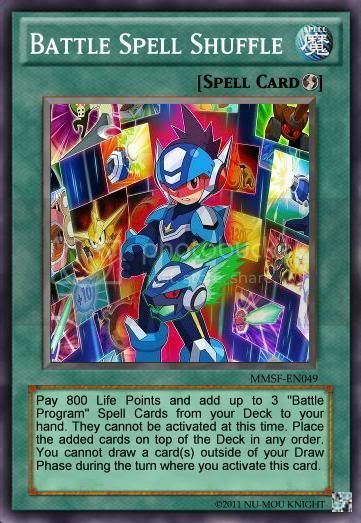 Pay 800 Life Points and add up to 3 "Battle Program" Spell Cards from your Deck to your hand. They cannot be activated at this time. Place the added cards on top of the Deck in any order. You cannot draw a card(s) outside of your Draw Phase during the turn where you activate this card. 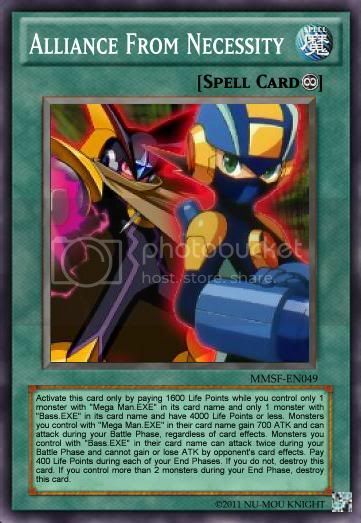 Activate only while you control a monster with "Mega Man.EXE" or "EM Mega Man" in its card name. Discard up to 3 cards and select the same number of cards your opponent controls. The selected cards cannot change their Battle Position, be flipped face-up, or activate their effects during this turn. If any of the selected cards are Monster Cards, they lose 600 DEF until the End Phase. Select 1 card on the field. If it is face-down, flip it face-up. Its effect is not activated at this time and it is flipped face-down after this effect resolves. Both players must search their respective Decks and send all cards with the same card name as the selected card to the Graveyard. If the selected card was a face-down Effect Monster, you can Special Summon 1 Level 4 or lower monster from your hand. The Special Summoned monster's ATK becomes the same as the selected monster's. 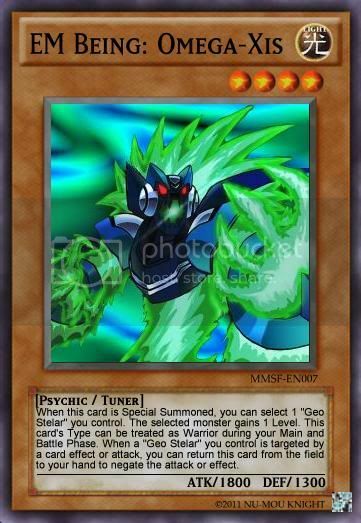 The selected card's effects are negated during the Phase where this card was activated. Activate this card only while you control "Rogue, Avenger of Mu". If a Spell Card is chained to this card, its effect is negated. Return 1 Level 8 or lower Monster, Spell, or Trap Card on your opponent's side of the field to its owner's hand for each Fiend-Type monster in your Graveyard. 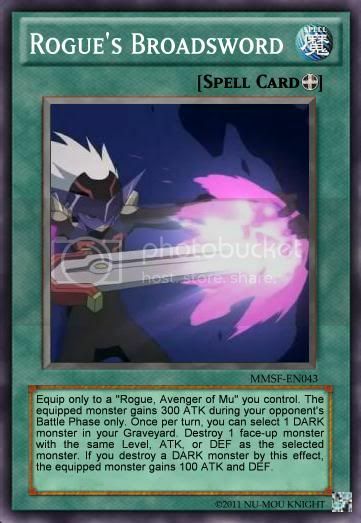 If your opponent has any Monster Cards on their side of the field after this effect resolves, select 1 "Rogue, The Mu Avenger". Only the selected monster can attack during this turn, and it can attack each monster your opponent controls once. Equip only to a DARK, LIGHT, or Warrior-Type monster you control. 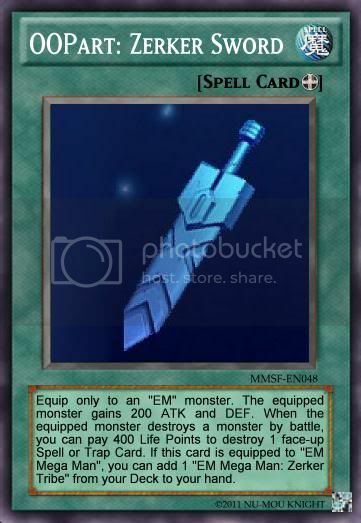 The equipped monster gains 1000 ATK and DEF, but its effect is negated while equipped with this card. The equipped monster loses 100 ATK and DEF for each card in your hand and that you control. Once per turn, if the equipped monster would be destroyed by an opponent's attack or Monster effect it is not. Equip only to a "Rogue, Avenger of Mu" you control. The equipped monster gains 300 ATK during your opponent's Battle Phase only. Once per turn, you can select 1 DARK monster in your Graveyard. Destroy 1 face-up monster with the same Level, ATK, or DEF as the selected monster. If you destroy a DARK monster by this effect, the equipped monster gains 100 ATK and DEF. Equip only to an "EM" monster. The equipped monster gains 400 DEF and 100 ATK. The equipped monster inflicts Piercing Battle Damage. 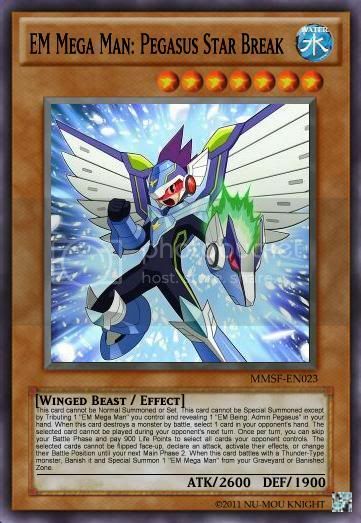 If this card is equipped to "EM Mega Man", you can add 1 "EM Mega Man: Saurian Tribe" from your Deck to your hand. Equip only to an "EM" monster. The equipped monster gains 300 ATK and loses 200 DEF. The equipped monster can lose 1000 ATK until the End Phase to allow it to attack directly. 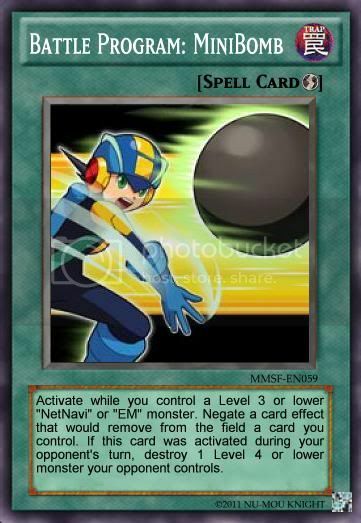 If this card is equipped to "EM Mega Man", you can add 1 "EM Mega Man: Shinobi Tribe" from your Deck to your hand. Equip only to an "EM" monster. The equipped monster gains 200 ATK and DEF. When the equipped monster destroys a monster by battle, you can pay 400 Life Points to destroy 1 face-up Spell or Trap Card. 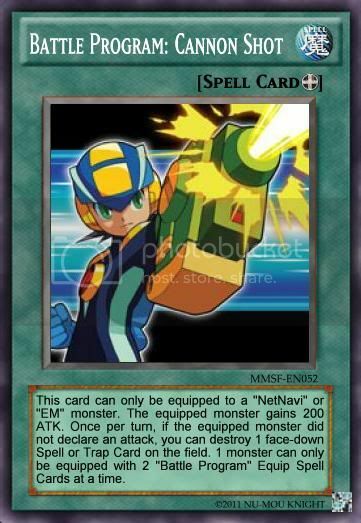 If this card is equipped to "EM Mega Man", you can add 1 "EM Mega Man: Zerker Tribe" from your Deck to your hand. 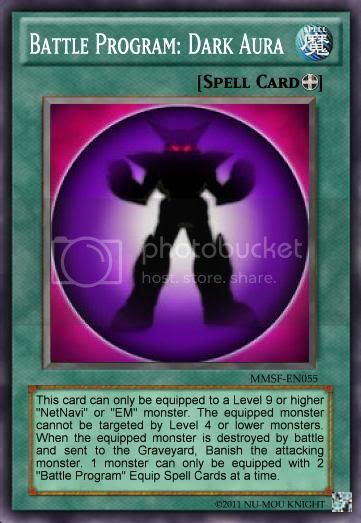 Activate only while you control a monster with "EM Mega Man" in its card name and a monster with "MegaMan.EXE" in its card name. 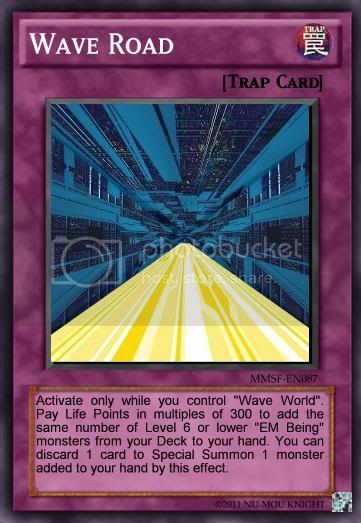 Pay 2000 Life Points when you activate this card. 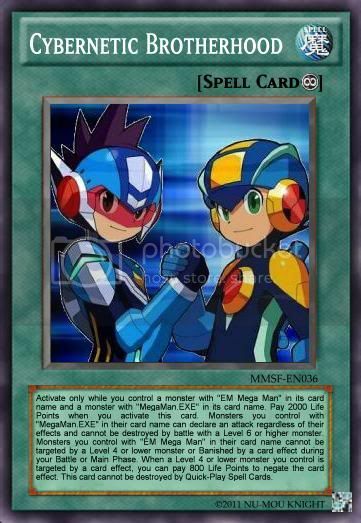 Monsters you control with "MegaMan.EXE" in their card name can declare an attack regardless of their effects and cannot be destroyed by battle with a Level 6 or higher monster. 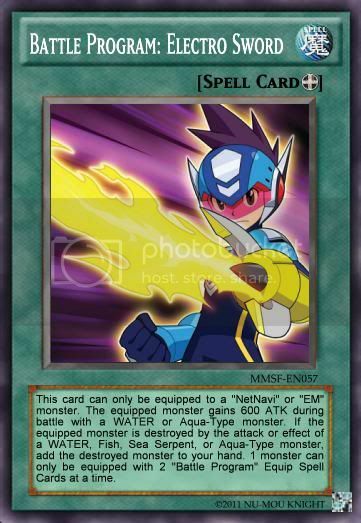 Monsters you control with "EM Mega Man" in their card name cannot be targeted by a Level 4 or lower monster or Banished by a card effect during your Battle or Main Phase. When a Level 4 or lower monster you control is targeted by a card effect, you can pay 800 Life Points to negate the card effect. This card cannot be destroyed by Quick-Play Spell Cards. 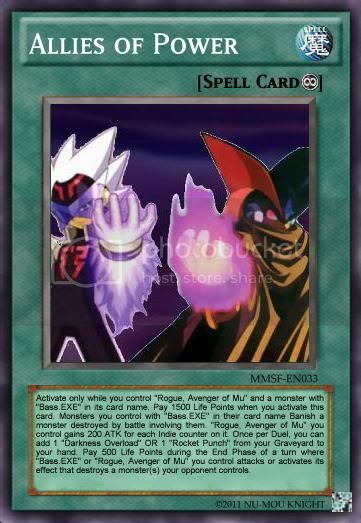 Activate only while you control "Rogue, Avenger of Mu" and a monster with "Bass.EXE" in its card name. Pay 1500 Life Points when you activate this card. 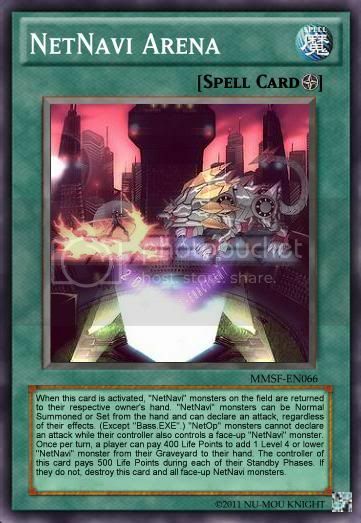 Monsters you control with "Bass.EXE" in their card name Banish a monster destroyed by battle involving them. "Rogue, Avenger of Mu" you control gains 200 ATK for each Indie counter on it. Once per Duel, you can add 1 "Darkness Overload" OR 1 "Rocket Punch" from your Graveyard to your hand. 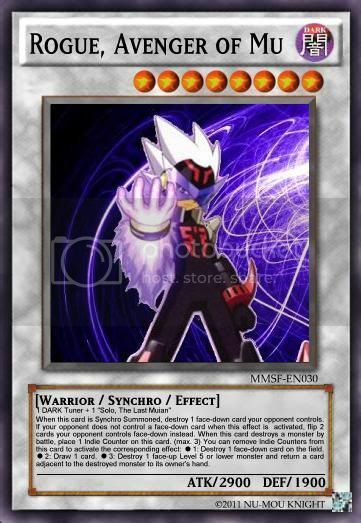 Pay 500 Life Points during the End Phase of a turn where "Bass.EXE" or "Rogue, Avenger of Mu" you control attacks or activates its effect that destroys a monster(s) your opponent controls. 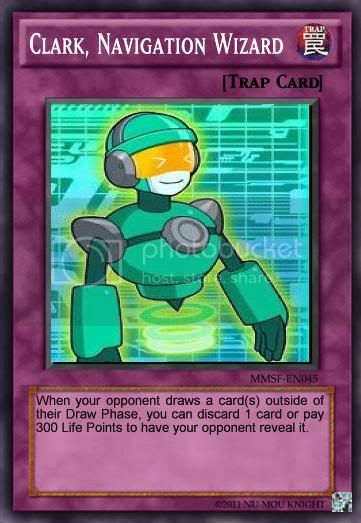 Activate this card only by paying 1600 Life Points while you control only 1 monster with "Mega Man.EXE" in its card name and only 1 monster with "Bass.EXE" in its card name and have 4000 Life Points or less. 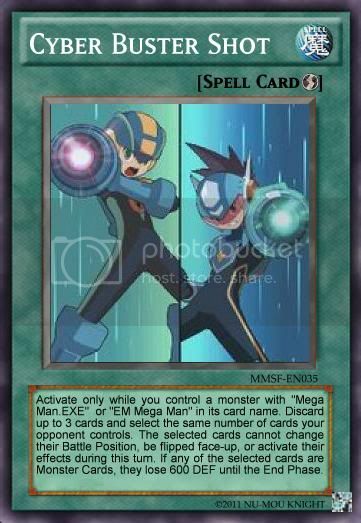 Monsters you control with "Mega Man.EXE" in their card name gain 700 ATK and can attack during your Battle Phase, regardless of card effects. Monsters you control with "Bass.EXE" in their card name can attack twice during your Battle Phase and cannot gain or lose ATK by opponent's card effects. Pay 400 Life Points during each of your End Phases. If you do not, destroy this card. If you control more than 2 monsters during your End Phase, destroy this card. "EM" monsters gain 200 ATK and DEF. Once per turn, you can discard 1 card to add 1 Synchro or Fusion "EM" monster in your Graveyard to your Extra Deck. Once per turn, you can pay 1000 Life Points to Special Summon 1 "EM Being" monster from your hand. 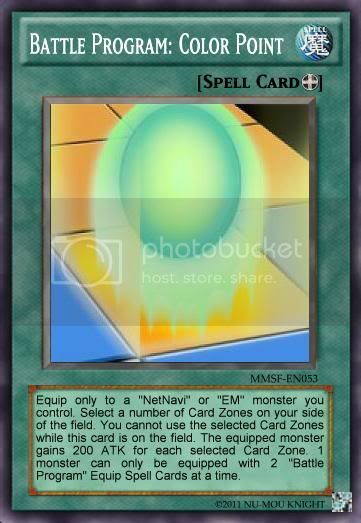 When this card is activated, "NetNavi" monsters on the field are returned to their respective owner's hand. "NetNavi" monsters can be Normal Summoned or Set from the hand and can declare an attack, regardless of their effects. (Except "Bass.EXE".) "NetOp" monsters cannot declare an attack while their controller also controls a face-up "NetNavi" monster. 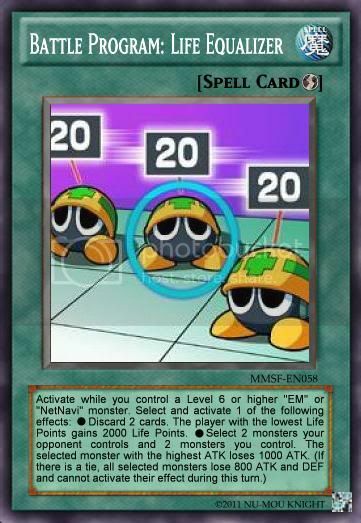 Once per turn, a player can pay 400 Life Points to add 1 Level 4 or lower "NetNavi" monster from their Graveyard to their hand. The controller of this card pays 500 Life Points during each of their Standby Phases. 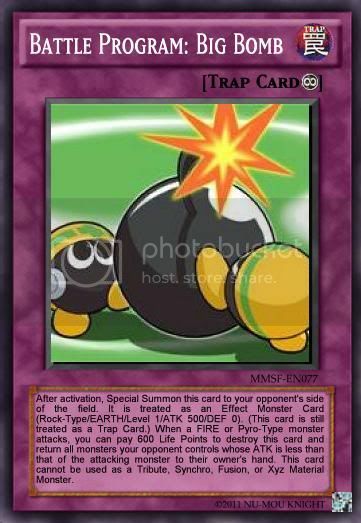 If they do not, destroy this card and all face-up NetNavi monsters. When your opponent draws a card(s) outside of their Draw Phase, you can discard 1 card or pay 300 Life Points to have your opponent reveal it. Select 1 card you control. The selected card cannot be destroyed during this turn. If the selected card is a monster, it gains 300 ATK and 400 DEF until the End Phase. 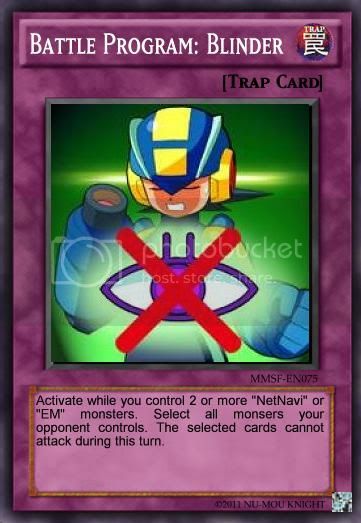 Activate only while you control a monster with "Mega Man.EXE" or "EM Mega Man" in its card name. (Except "Mega Man.EXE" and "EM Mega Man".) 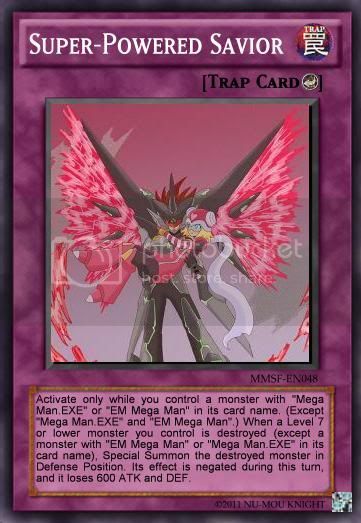 When a Level 7 or lower monster you control is destroyed (except a monster with "EM Mega Man" or "Mega Man.EXE" in its card name), Special Summon the destroyed monster in Defense Position. Its effect is negated during this turn, and it loses 600 ATK and DEF. Activate only while you control "Wave World". Pay Life Points in multiples of 300 to add the same number of Level 6 or lower "EM Being" monsters from your Deck to your hand. You can discard 1 card to Special Summon 1 monster added to your hand by this effect. After activation, this card id Special Summoned to your opponent's side of the field in Defense Position. 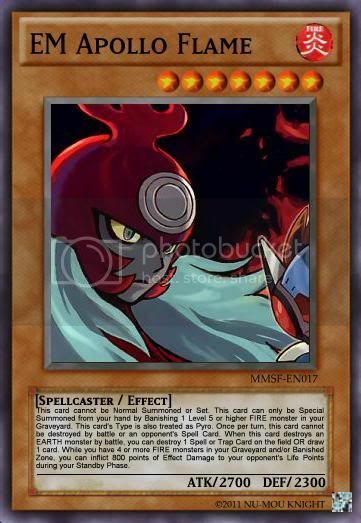 It is treated as an Effect Monster Card (Rock-Type/DARK/Level 1/ATK 0/DEF 2000). (This card is still treated as a Trap Card.) Once per turn, the controller of this card must discard 1 card. The controller of this card loses 600 Life Points during their Standby Phase. This card cannot be used as a Tribute, Synchro, Fusion, or Xyz Material Monster. After activation, Special Summon this card to your opponent's side of the field. It is treated as an Effect Monster Card (Rock-Type/EARTH/Level 1/ATK 500/DEF 0). (This card is still treated as a Trap Card.) 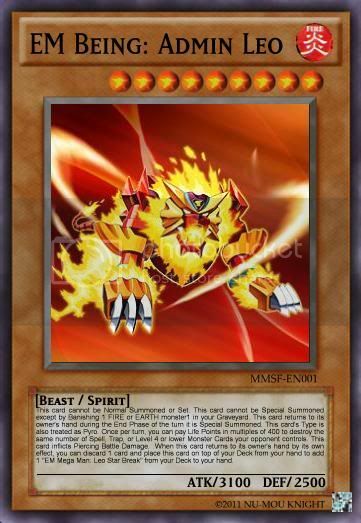 When a FIRE or Pyro-Type monster attacks, you can pay 600 Life Points to destroy this card and return all monsters your opponent controls whose ATK is less than that of the attacking monster to their owner's hand. 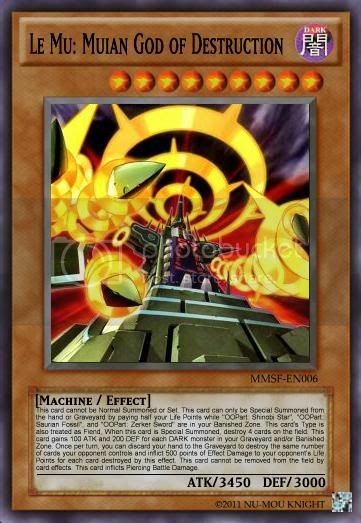 This card cannot be used as a Tribute, Synchro, Fusion, or Xyz Material Monster. Activate while you control 2 or more "NetNavi" or "EM" monsters. Select all monsters your opponent controls. The selected cards cannot attack during this turn. 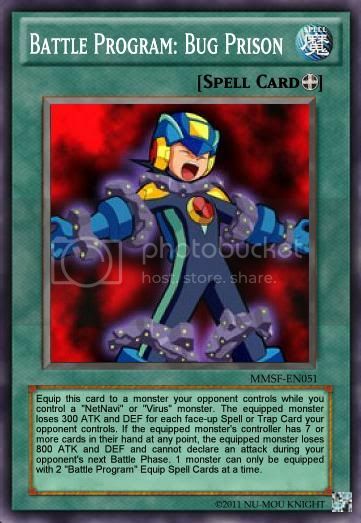 Equip this card to a monster your opponent controls while you control a "NetNavi" or "Virus" monster. The equipped monster loses 300 ATK and DEF for each face-up Spell or Trap Card your opponent controls. If the equipped monster's controller has 7 or more cards in their hand at any point, the equipped monster loses 800 ATK and DEF and cannot declare an attack during your opponent's next Battle Phase. 1 monster can only be equipped with 2 "Battle Program" Equip Spell Cards at a time. This card can only be equipped to a "NetNavi" or "EM" monster. The equipped monster gains 200 ATK. Once per turn, if the equipped monster did not declare an attack, you can destroy 1 face-down Spell or Trap Card on the field. 1 monster can only be equipped with 2 "Battle Program" Equip Spell Cards at a time. 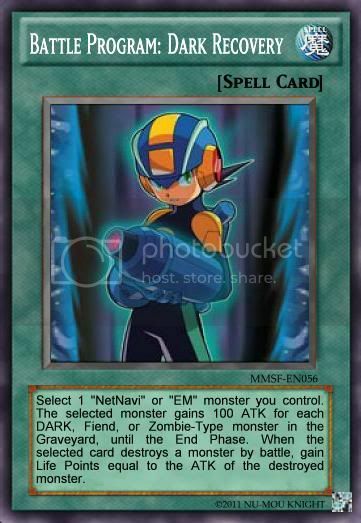 Equip only to a "NetNavi" or "EM" monster you control. Select a number of Card Zones on your side of the field. You cannot use the selected Card Zones while this card is on the field. The equipped monster gains 200 ATK for each selected Card Zone. 1 monster can only be equipped with 2 "Battle Program" Equip Spell Cards at a time. 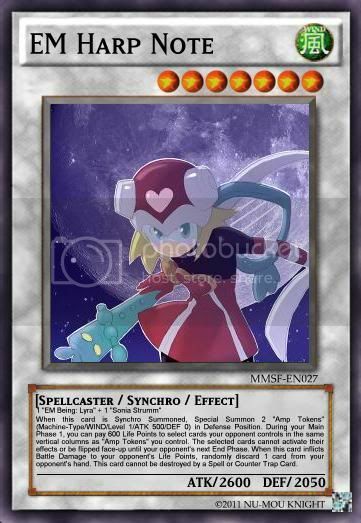 Equip only to a "NetNavi" or "EM" monster you control. The equipped monster gains 100 ATK for each card in your hand. While you have 6 or more cards in your hand, the equipped monster loses 200 ATK instead. 1 monster can only be equipped with 2 "Battle Program" Equip Spell Cards at a time. This card can only be equipped to a Level 9 or higher "NetNavi" or "EM" monster. 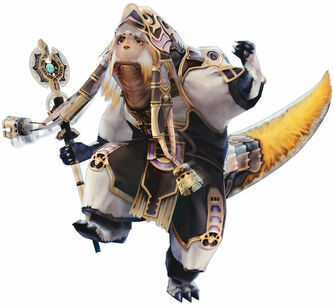 The equipped monster cannot be targeted by Level 4 or lower monsters. When the equipped monster is destroyed by battle and sent to the Graveyard, Banish the attacking monster. 1 monster can only be equipped with 2 "Battle Program" Equip Spell Cards at a time. Select 1 "NetNavi" or "EM" monster you control. The selected monster gains 100 ATK for each DARK, Fiend, or Zombie-Type monster in the Graveyard, until the End Phase. When the selected card destroys a monster by battle, gain Life Points equal to the ATK of the destroyed monster. 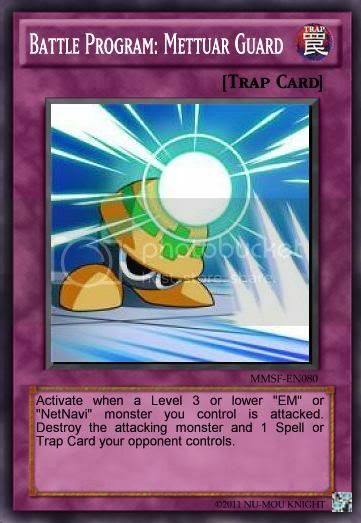 This card can only be equipped to a "NetNavi" or "EM" monster. The equipped monster gains 600 ATK during battle with a WATER or Aqua-Type monster. If the equipped monster is destroyed by the attack or effect of a WATER, Fish, Sea Serpent, or Aqua-Type monster, add the destroyed monster to your hand. 1 monster can only be equipped with 2 "Battle Program" Equip Spell Cards at a time. After activation, this card is Special Summoned in Defense Position. It is treated as an Effect Monster Card (Rock-Type/EARTH/Level 2/ATK 500/DEF 2000). (This card is still treated as a Trap Card.) 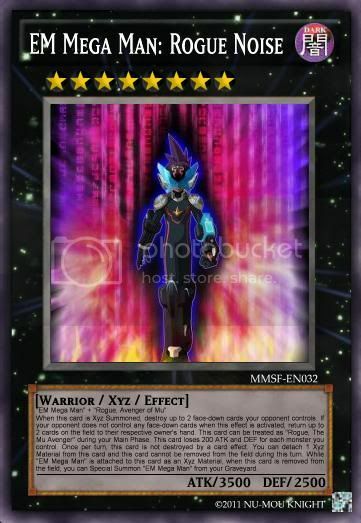 If a monster you control would be destroyed by battle with an Effect Monster, Tribute this card as an Effect Monster Card to negate the attack and inflct 2000 points of Effect Damage to your opponent's Life Points. Your opponent loses 500 Life Points for each card in their hand. You lose 300 Life Points for each card in your hand. Both players discard 4 cards, then draw 2 cards. If a player cannot discard 4 cards, they lose 800 Life Points and draw only 1 card instead. Activate when a Level 3 or lower "EM" or "NetNavi" monster you control is attacked. Destroy the attacking monster and 1 Spell or Trap Card your opponent controls. Activate while you control a Level 3 or lower "NetNavi" or "EM" monster. Negate a card effect that would remove from the field a card you control. 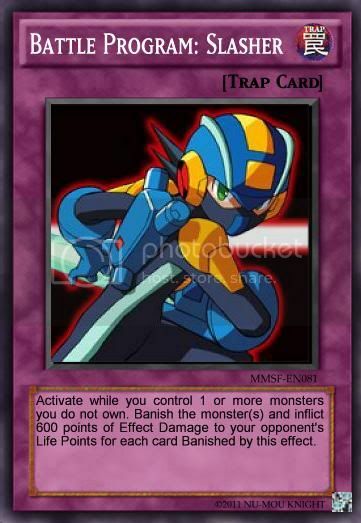 If this card was activated during your opponent's turn, destroy 1 Level 4 or lower monster your opponent controls. 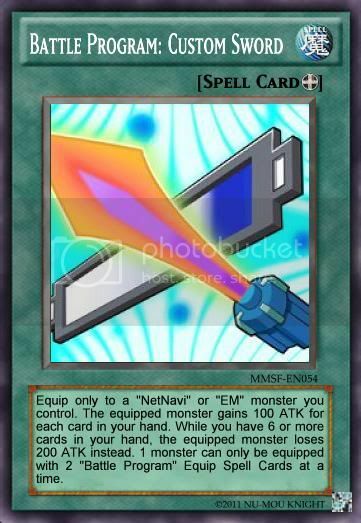 Equip only to a Level 2 or lower "NetNavi" or "EM" monster you control. The equipped monster gains ATK equal to the difference of the your and your opponent's Life Points. The equipped monster can only gain up to 4000 ATK by this effect. 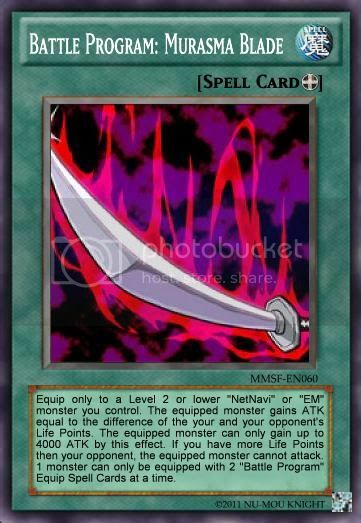 If you have more Life Points then your opponent, the equipped monster cannot attack. 1 monster can only be equipped with 2 "Battle Program" Equip Spell Cards at a time. Cards on the field cannot be returned to the hand by Spell or Trap Card effects. If a Monster Card is destroyed by an opponent's Monster Effect, add the destroyed or reurned card to its owner's hand from the Graveyard at the End Phase. Select 1 face-up Level 8 or lower "NetNavi" or "EM" monster you control. The selected card loses 1500 ATK. Destroy all face-up monsters whose ATK is less than that of the selected monster. Activate while you control 1 or more monsters you do not own. Banish the monster(s) and inflict 600 points of Effect Damage to your opponent's Life Points for each card Banished by this effect. Don't be afraid, I'm just a wolf. Again, thanks a bunch for the comment. I will be adding to this set when I get my keyboard fixed, so stick around for more if you like. Thanks man. Anyone else care to comment? Cool, thanks. I've started working on the addition, should be up by tonight. Equip only to a DARK, LIGHT, or Warrior-Type monster you control. 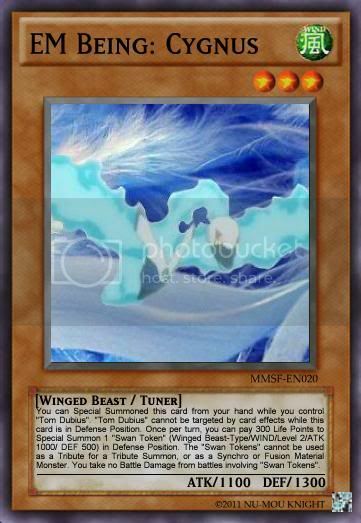 The equipped monster gains 1000 ATK and DEF, but its effect(s) is negated while equipped with this card. The equipped monster loses 100 ATK and DEF for each card in your hand and that you control. Once per turn if the equipped monster would be destroyed by battle or by a Monster effect it is not. I think this is the correct OCG for this, but I got this from older cards not apart of the new OCG so I'm unsure if it fits with the new one. Visit my Final Fantasy Deck Collection and offer your critiques please. I assume you're using Indie Proof? Hmm...doesn't "effect" pretty much cover the whole effect text? And I think the last sentence is just a minor problem, though I will correct the text with it. Anything else to say, besides just correcting the Proof? Thanks, Hane. Anything special about those EMs that causes you to love them so? Well I'll just comment on the effects. Overall they seem to work better than your last sets. The XYZ sounds nasty. I don't understand why you have 2 pics for your fusion monsters though. Ah. Good to hear. As for your pic point, one (you can tell because they're a bit blurry) is the original image of 3 of the "Double Tribes". The others are alternate but equivalent cards, and have clearer artwork put together by me. I'll be putting up some of the new cards,like the Xyz Tribe King and his support card, Tribe King Calling. I'm working on making the Noise Forms and the Star Breaks, though I will put up the EM Admins. Also, due to the overall weakness of my NetNavis (In hindsight anyway, though I do have a new Field Spell for them, should remind FF Fan of Summons World) and the lack of difference between Battle Cards and Battle Chips, they are now summed up into "Battle Programs". I'll begin translating the existing ones immediately after I finish with the current section. Battle Programs posted. Others are coming, since I originally had them on this site. Star Breaks also added, and a new Field Spell made for the old NetNavis. Oi...sorry lookers, whoever you may be. School and such have been keeping me busy recently, so I haven't gotten to update this recently. I'll try to post more cards once I get them done. I'mJapanese and I'm creating Japanese version of your created cards without your permission. Please give me permission to make them. If you give me it,I'll disclose on Yugico.com. Please repply this.I wait exceptantly. 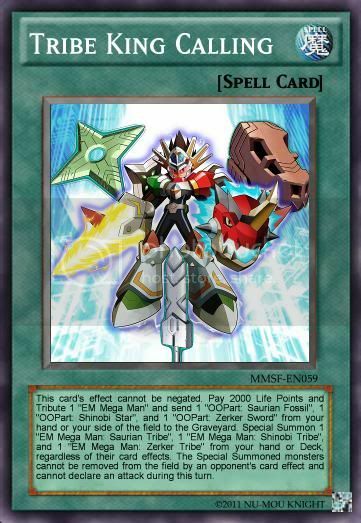 My original MMSF's yugioh cards disclose on Yugico.com . I think you don't know Japanese,but　please look them. My name on Yugico.com is tom-verry. I Changed picture on any cards,and Andormada will be Changed to Ritual from effect. Sinece I never give permission from you,I will discrose them.OK?